Like Ruhlman's The Making of a Chef, this is an instant classic in food writing - one of the fastest growing and most popular subjects today. I was worried when this book started out as I was thinking it was just another book trying to capitalize on the reality show / Iron Chef craze. The beginning covers the Master Chef exam and was like that. So, initially I was turned off but then the author began to detail a chef, really getting into the person behind the title. He then covered another, the head chef of the French Laundry in Napa Valley. The horizon of cooking then just really began to open through masterful story development. It helps that Michael Ruhlman actually went to the CIA, took classes and has developed a real insight into the craft of cooking and chefs. The narration was excellent, a good narrator really opens up a book as it should be. Good Fun, Even if You Don't Cook! I'm not a Kitchen Goddess, rather silly, actually (Seriously--I recently ordered Seared Ahi Tuna and discovered... that sucker's RAW!). But even I know about tension, failure, boisterous personalities, and the drive for perfection. "The Soul of a Chef" chronicles all that and then some. We open to the enormous pressure to become a Certified Master Chef, follow with a wonderful chef who just makes you feel good, and end with the near perfection of The French Laundry (this latter part, by the way, was the only part I felt that made the book drag a bit). Along the way is the devastation of having a PERFECT Duck Tureen that is OH NO! Spoiled by unfortunate knife skills. Humidity causing Crepe Crises! Overcooked pasta (Blasphemy! And: The delivery guy can wait... pasta can't)! Respecting food so much that you'll kill your own rabbits, thank you very much (Note: Rabbits scream). And food combinations that'll have you scratching your head. Only dreamers and geniuses think like that, and God bless them, they're usually right. Add to this an author whose own studies of cooking have him hungry (sorry, couldn't resist the pun) to seek out food, cooking, creatives, misery and you have a winner of a book. Especially since, when out with one of the most famous food critics, all he can think of is, "I've GOTTA remember to say that next time I'm out," you know you're in the hands of someone who can laugh at himself. "The Soul of a Chef" tries to continue where "The Making of a Chef" ends... from learning to be a chef to becoming an executive chef. However, unlike his earlier book, this book does follow the journey of one person. It's more like three novellas in one book, not necessarily a bad thing but not a singular story as the title suggest. The author's style is entertaining and vivid... the preparation of the dishes are described in mouth-watering details. If you are in awe of Thomas Keller and the French Laundry, the third section will elevate that appreciation even more. Thomas Keller thinks about food to levels probably no other chefs think about. In other restaurants, asparagus laid flat in a tray. At the French Laundry, they are tied in a bunch sitting in water. Every little thing matters for Thomas Keller. What did you love best about The Soul of a Chef? The thing liked about this book is the subject. Cooking is interesting, the mindset is fascinating and the CSI is mystical. The thing I loved about The Soul of a Chef is the believable peek behind the curtain. 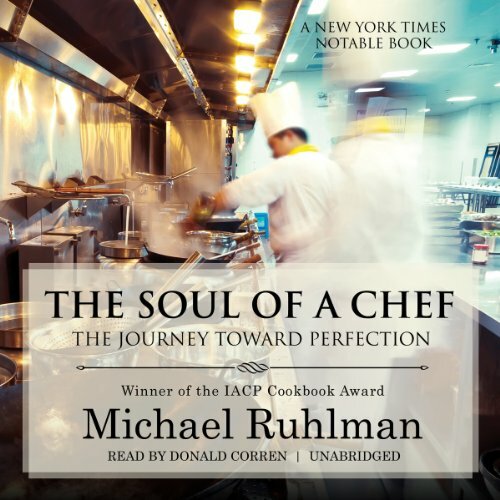 What other book might you compare The Soul of a Chef to and why? "Life on the Line" is a book I might compare based on the detail regarding the inner workings of a professional kitchen and the conviction it takes to succeed. Likewise, "Butter, Bones & Butter" for the life psychology and growth as young cooks make their way from inauspicious beginnings. What aspect of Donald Corren’s performance would you have changed? Corren's read was flat for my tastes. Not a lot of dynamic range or inflection in the reading. Where some voice actors can make you forget your listening to a reader and transport you through the eyes of the writer, Donald Corren did not do this for me. If The Soul' were to be made into a movie, the tagline could be "Brown Sauce, Taste It!" The subject of the book made it compelling. Props to Ruhlman for being so dedicated to seeing the challenge through, but I do wish he had a bit more dynamic presence in his writing. The voicing didn't help. Hence the 4 stars. Eye-opening (and hunger-inducing) book about great chefs and the ceaseless striving for perfection. Television viewers might recognize author Michael Ruhlman from his numerous appearances on Anthony Bourdain's television shows. Ruhlman had a long-standing fascination with cooking and broke into larger renown with his book, The Making of a Chef, in which he chronicled attending the Culinary Institute of America. His fascination with food and the people who master the art of cooking only grew and in this book, he looks at chefs at the top of their game. In reality, this book is really three longer pieces (not quite essays, sort of non-fiction novellas), the first about the Culinary Institute's Certified Master Chef exam, the second about Cleveland-chef Michael Symon, and the third about Thomas Keller (renowned chef-owner of The French Laundry). The first section is the best and the most suspenseful, you get invested in the chefs trying to get their certification. The second section entertained me, but mostly because I am from Cleveland and familiar with Symon. The third section was interesting, but at times too reverential. I think for foodies and chefs, this book might be particularly satisfying. For the more casual reader, it is definitely interesting and eye-opening, but sometimes a tad overwrought. Donald Corren did a fabulous job narrating this well-written book. I could all but "taste" the dishes as I "felt" what the chefs were going thru. I couldn't put the book down. This book was not what I expected, but I seriously enjoyed it. it begins with an observation of the Certified Master Chef exam, them jumps into a personal look at, and conversations with, America's two most exciting chefs: Michael Symon and Thomas Keller. I loved this read. I'd recommend it to someone in the cooking industry, but I probably wouldn't recommend it for the more casually interested. The most captivating part, to me, was the first third of the narration, which focused on the CMC test. It had a sense of tension that the rest of the book was generally lacking. The last section on The French Laundry seemed to drag on too long for me. This title could have benefited greatly from a narrator with a more lively voice. The narrator was very one-note, giving a fairly emotionless reading that bordered on sounding mechanical. Whenever he read a large list of foods, I felt like I was listening to a sleep app with the goal of knocking me out quickly. There is a challenge with a food-centric book in that we are so often visual creatures when it comes to cooking. A documentary based on the book would certainly provide a better reference. I should note that I'm coming into this review not as a chef or as anyone in the cooking industry, but as a person with average food knowledge. That may make the difference for you because so much of this book is about finer foods and techniques that I had no point of reference for. I believe those with this knowledge would find it more immersive. Insight to the passion that some have for creating food, the detail at which they do it, and the never ending drive one needs to work in this profession. What does Donald Corren bring to the story that you wouldn’t experience if you just read the book? fantastic book. the writing is excellent and really puts the reader in the author's place. great sense of the life and drive of a chef and what it takes to succeed in such a business. also fantastic to hear about now-famous chefs before they were anybody were good, upstanding people. Good book, but more philosophical and introspective than "The Making of a Chef", which I prefer. However, what really turnes me off is the caricaturization of foreign accents in this narrated version, specifically for French chefs. Totally uncalled for. Also the dramatization was over the top some points. The first book was narrated by other person, who didn't have to imitate foreign accents to deliver the story.